Onésimo Díaz has just published a new book in the Collection of monographs of the St. Josemaría Escrivá Historical Institute. It is entitled: “Posguerra. La primera expansión del Opus Dei durante los años 1939 y 1940”. 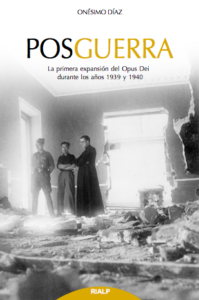 The publication focuses on the growth of Opus Dei in the years just after the end of the Spanish Civil War in 1939, and may be considered in some sense a continuation of the works published by J. L. González Gullón in the same series of ISJE monographs: “DYA. La Academia y Residencia en la historia del Opus Dei (1933-1939)” and “Escondidos. El Opus Dei en la zona republicana durante la Guerra Civil española (1936-1939)“. 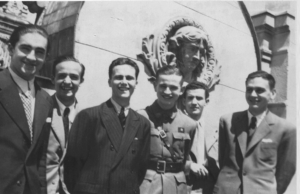 The primary objective of the study is to portray the development of Opus Dei as an institution in the immediate post-war period, giving special attention to the trips carried out from the Jenner Residence in Madrid to other cities to extend the apostolate. It also offers an overview of the people who came in contact with the Work, especially those who became members. All of them, with the encouragement of José María Escrivá, made possible the international expansion of this institution. The content is enriched by the consultation of numerous sources which are largely unpublished and are preserved in the General Archives of the Prelature. These include the diaries of some centers of Opus Dei, the reports of trips written by those who travelled from Madrid to meet young university students in other cities, the letters of the founder and the first members, the recollections of some people, etc. The first two chapters offer an overview of the political, cultural and religious situation in Spain at the end of the Civil War. These pages serve as a contextual framework and help to understand why the expansion of Opus Dei was confined to Spanish territory because of the international war. August 1940, on the terrace of the Jenner Residence. Some people who attended the second study-week. The study of the diffusion of the Work in the post-war period is then dealt with: the third chapter examines the life of Opus Dei in Madrid during the spring and summer of 1939; the fourth chapter focuses on the expansion of Opus Dei in Valencia; the fifth and sixth chapters deal with the growth of the Work during the two semester courses of 1939-1940; the seventh chapter presents the first three “study-weeks” during Holy Week and the summer of 1940, consisting of a few days of living together for young people recently incorporated into Opus Dei to receive instruction from the founder. The last chapter briefly describes the opening of two new centers and the apostolate with graduates. Onésimo Díaz holds a PhD in Contemporary History from the University of the Basque Country and a PhD in Church History from the University of the Holy Cross (Rome). He is a researcher at the Josemaría Escrivá de Balaguer Documentation and Study Center at the University of Navarre, and he is the author of a dozen books on Contemporary History.